Mount Taranaki or Mount Egmont is one of New Zealand's most spectacular volcanoes, and at 2518-metres high it can be seen from miles away on a clear day. Visitors to the mountain come to enjoy the Manganui skifield on the eastern slopes, to climb the mountain via the Summit Track, explore Egmont National Park which encompasses the mountain as well as other recreation activities such as rock climbing, picnics, walks, scenic tours and tramping. According to Maori mythology, Taranaki once resided in the central North Island, with all the other New Zealand volcanoes. He was forced to flee when his love for the beautiful Pihanga was challenged in particular by Tongariro. 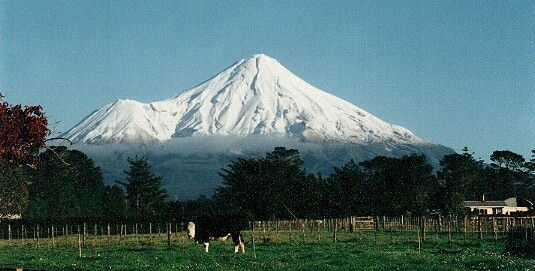 Taranaki fled and was caught by the sun and remains to this day in his current location. Rain on the mountain is thought to suggest his tears and the beautiful sunsets his way of showing off to his distant love. Tongariro's eruptions are said to be a warning to Taranaki not to return. The North Egmont Visitor centre has track and walk information and displays on the history of the area.